Everybody is awed by the amazing things that happen in the sky when clouds are struck by the light of the Sun crossing the horizon. I’m no different but I don’t want to paint cliches so selecting a personal viewpoint is important. There are sunsets where a camera is your best choice and sometimes you need nothing more than a glass of wine or cold beer and a comfy chair. Occasionally however, a particular combination of elements come together and cry out to me “PAINT THIS!”. For me it usually involves a muted silhouette of really interesting shapes juxtaposed against a riot in the sky. Then I have a great excuse to pull out every vibrant coloured tube of pigment I can find in my paint box and really have some fun – For the strongly coloured clouds and sky passages I want intensity (full chroma) in every hue as much as I can get. For example, six cadmium tube colours in one cloud? Yep. See the section of sky in the painting detail below? High chroma opaques right across the yellow and orange spectrums. You can see the first five of these pigments, left to right, in the paint swatches pictured. 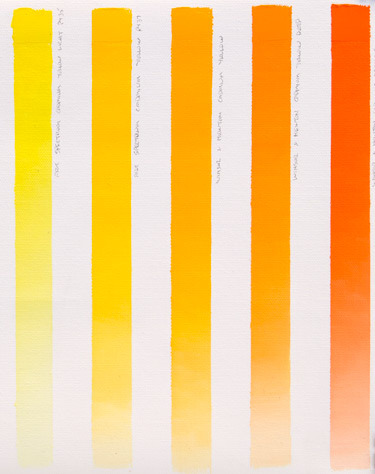 Each swatch is mixed from body strength (thick, straight out of the tube) through all possible tints with white. The Cadmium Scarlet which is one of the most intensely strong coloured reds is not pictured. It is used just a bit in the clouds but more for mixing with Cerulean Blue to make magnificent pastel sky “steel” blues, pinks and soft mauves, as you can see in the top left of the painting detail above. Nocturne painting is a term coined by James Abbott McNeill Whistler to describe a painting style that depicts scenes evocative of the night or subjects as they appear in a veil of light, in twilight, or in the absence of direct light. In a broader usage, the term has come to refer to any painting of a night scene, or night-piece, such as Rembrandt’s The Night Watch. Whistler used the term within the title of his works to represent paintings with a “dreamy, pensive mood” by applying a musical name. He also titled (and retitled) works using other terms associated with music, such as a “symphony”, “harmony”, “study” or “arrangement”, to emphasize the tonal qualities and the composition and to de-emphasize the narrative content. I’m aiming at the pictorial equivalent of Beethoven’s “Moonlight Sonata”. Romantic, restful and harmonious. I can’t describe it any better than that. Nocturnes are a genre I really want to paint more of. 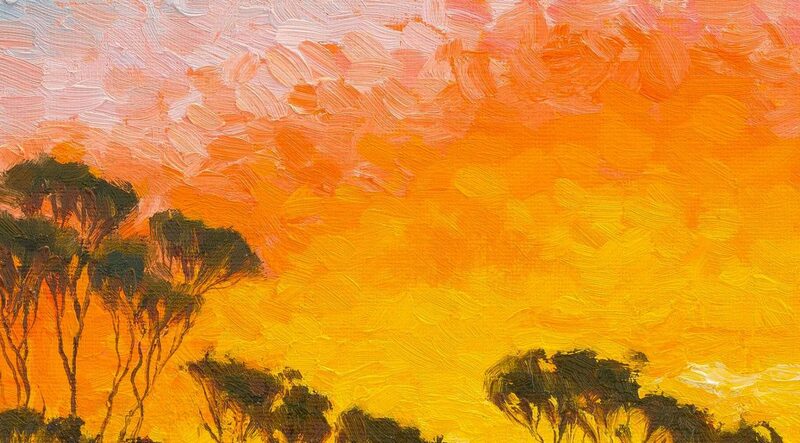 I have just added three new outback evening paintings to my online gallery, two sunsets and a nocturne. I hope you enjoy them.